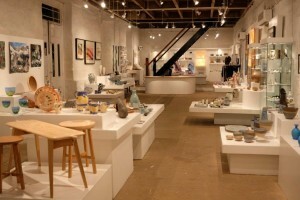 Trelowarren has provided the main exhibition and retail space for the Cornwall Crafts Association since 1978, when the CCA set up its first permanent gallery in a Georgian stable-block on the estate with the aid of a grant from the Crafts Council. Although there is now a second gallery at Trelissick, ours remains the association’s largest display-space, with the additional benefit of a shop where visitors and guests can buy items on display throughout the year. The gallery houses a changing portfolio of multi-media crafts, including pottery and ceramics, textiles, jewellery, sculpture and furniture. Only fine art – which has its own separate space on the estate – and reproduction work are excluded by the association’s selection process. The changing themes and dates of exhibitions can be found on the CCA’s website together with details of externally produced, travelling exhibitions and displays which punctuate the local programme or for further details and opening times please phone 01326 221567.